I must tell you that the BioSmart® Heater I bought from you has been absolutely the very best investment I have ever made. I am sure you receive letters like this all the time, because you have such a fantastic product. The BioSmart® Air Purifier offers more technologies, more capacity, and cleans your air nearly three times as fast (under 11 minutes for a 20X20 room) as other air purification systems! Quite simply, no other air purifier offers all the features of the BioSmart® air purifier for anywhere near the price. Great care was taken in the design of the SA-5 model 700 to select mechanical components of the highest performance, quality, and efficiency. Low-draw LED indicators, fluorescent UV bulbs, advanced scroll fans, and ultra-stable power supplies are just a few examples of a design philosophy that creates one of the most incredible room air purifiers on the market. The SA-5 model 700 is capable of processing the air in a 650 – 800 sq ft room, and yet consumes less electricity than a standard light bulb. This truly energy-efficient air purification benefits both your personal home environment and the environment as a whole. 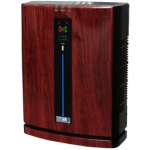 We offer the most affordable truly comprehensive air purifier ever. Now is the time to upgrade beyond basic allergen removal and advance to actual health protection. Join our thousands of satisfied customers and make an investment in a healthier, longer life! This simple filter is one of the most critical steps in the filtration sequence because it removes the burden of larger airborne particles from the other filter stages. This extends the life of the HEPA and Carbon filters, which are more costly to manufacture and replace. The SA-5 model 700’s pre-filter is constructed of fibers that build a static charge as air moves through it, causing a powerful attraction to dust, hair, pollen, and other airborne materials. The pre-filter can be removed and cleaned easily and will last throughout the unit’s lifespan. A popular and proven technology, the industrial grade HEPA filter in the SA-5 model 700 effectively removes most contaminants from your air. This technology is only as effective as the type of HEPA material used, and not all HEPA fabrics are equal in performance. The HEPA material used in the SA-5 model 700 is the best available, and is rated to trap particles as small as 0.1 microns in size at 99.99% efficiency, outperforming other HEPA filters on the market. Activated Carbon is a micro-porous material which is used in many types of filtration systems because of its effectiveness at removing a wide variety of dangerous contaminants. Due to the tremendous surface area of activated carbon, it has the ability to filter out gaseous pollutants, volatile organic compounds, and hydrocarbons. Because of its porous composition, the carbon in the SA-5 model 700 has over a square kilometer of surface area! This creates countless bonding sites for contaminants to attach through a chemical attraction process called “adsorption”, which safely and permanently removes them from the air. Moisture present in the air can negatively affect the performance of ordinary carbon filters, which is why the Bio-Smart™ carbon filter in the SA-5 model 700 is treated in a special process to make it moisture-resistant, or “hydrophobic”. Other carbon filters lacking this feature will saturate with water and rapidly become less effective at removing airborne contaminants. The Bio-Smart™ carbon filter is one of the highest quality carbon filters available, containing over 4 pounds of solid activated carbon, unlike other filters on the market that use a dust coating or a small quantity of granules. The UV light purifies the air passing through the system by destroying organic contaminants on contact. Ultraviolet light is destructive to living cells and organic substances, and is deadly to airborne contaminants like bacteria, viruses, fungal spores, pollen, and other organic allergens. 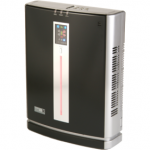 The UV energy also sanitizes internal surfaces of the SA-5 model 700 air purifier. This helps prevent bacteria and mold from growing inside the unit and further contaminating your air. The UV light acts as a photo-catalyst on the Ti02 membrane, causing the release of Hydroxyl Radical particles. Hydroxyl Radicals are a tremendously powerful air purification technology effective against many types of organic and chemical pollution. Ti02 (titanium dioxide), a common and inert substance, creates powerful Hydroxyl Radicals when exposed to ultraviolet light. Hydroxyl Radicals exist naturally in the Earth’s atmosphere, and play an important part in eliminating greenhouse gases and volatile organic compounds. They can do the same in your home. Hydroxyl Radicals work by oxidizing pollutants in a manner similar to ozone. They are even more effective, but are much safer than ozone, which can damage lung tissue. 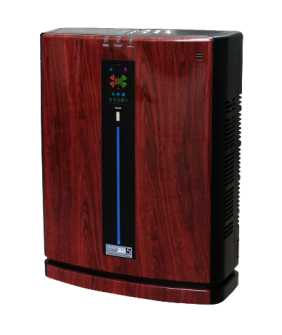 The Hydroxyl Radical technology of the SA-5 model 700 air purifier offers your home tremendous air purification without the health risks associated with ozone. Your air purifier should be the last place you could expect to find a risk of lung damage! Negatively charged ions (Anions) attach themselves to airborne particles and cause them to fall out of the air. This provides relief for your sinuses and nasal passages, and makes them easy to remove from your environment by simply using your vacuum cleaner. Negative ions occur naturally in high quantities around moving water, such as beaches and waterfalls, and create a sense of freshness in the air when inhaled. There are numerous other documented benefits to negative ions, including improvement in lung function. Many companies sell less powerful anion generators as standalone devices for hundreds of dollars! This feature is also switchable, to provide you with the most flexible air purification options possible. 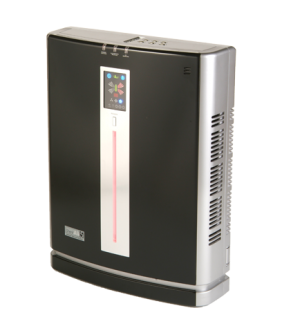 The SA-5 model 700 features a computer-controlled particulate detector which can determine an increase in pollution particles in your room, and compensate by automatically adjusting its own settings. When in this mode, you can rest assured that the unit will operate intelligently without input from you, increasing its performance as needed to match your changing environment throughout the day. It is automatic set-and-forget protection for you and your family. Home Air Check™ is an advanced test that identifies over 400 VOCs (Volatile Organic Compounds, i.e., airborne chemicals), formaldehyde, growing mold, and secondhand smoke that may be lurking in your home’s air. Home Air Check provides an easy-to-use test kit for air sample collection, sample analysis done by an accredited laboratory, and an easy-to-understand report. The report provides guidance to create healthier air and this guidance along with using a BioSmart Solutions SterilAir™ Air Purifier can assure you that you’re on the path of improved indoor air quality and overall health.